The Moon's shadow enveloped the clouds over the sea and turned the sky a deep blue. 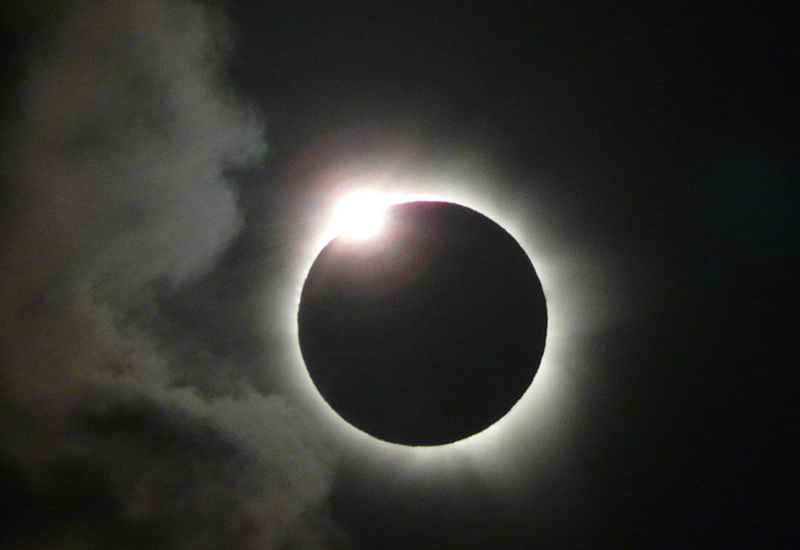 The presence of a rogue cloud below the eclipsed Sun diverted the light of the corona upwards and made it into a cone. Sleepily we gathered at the front of the Travelers Oasis in Cairns, our home for the previous week. Looking up, some stars and planets were visible. It also spat rain. Unlike previous eclipses which were obviously going to be good or (in the case of Cornwall 1999 and China 2009) bad, this eclipse was touch and go weather-wise. It would prove to be the nail-biting and tense eclipse. We had arranged for the airport shuttle to ferry a large group of us to our eclipse site and it duly arrived, being driven by Dom, the owner of the company itself. Several cars followed us, most containing the hotel staff who had decided to abandon the place of work for a few hours at my suggestion. Let's hope their bosses never see this email. Like an Indonesian minibus conductor I walked along the aisle and collected the ten dollars fee from everyone to pay the driver. Our destination was Machans Beach which was the first "beach" north of the airport. I chose it because it was actually a residential area, unmentioned in any police list of road closures or parking restrictions and by any guide book. It wasn't even really a beach, just a sea-front road high above the sea which would be moving towards a high New Moon, Spring tide during the eclipse. Very few outsiders had chosen this spot. The other people present were mainly locals who lived in the village. I spoke to these locals, thanking them for allowing us to watch the event with them and giving them information about what they might see and how to view it safely. The woman outside whose house we had based ourselves followed proceedings in her dressing gown. 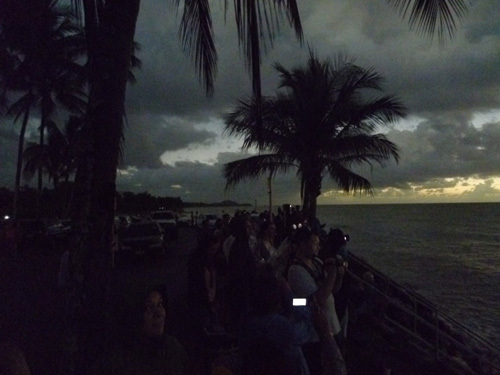 The 50-50 nature of this eclipse can be seen from the fact that I spent half the time showing people the stars and planets and the other half sheltering from the rain. The woman in the dressing gown even gave me a bright yellow rain mac, making me look like a tour leader. One nice moment occurred when we saw the Southern Cross for the first time on this trip. Everybody from the Northern Hemisphere enjoyed this moment. After all, the Southern Cross is the only constellation to appear on a national flag, that of our host country, Australia. Two Swedish men (Ivar and Tamas) who had been clouded out with us during the China eclipse and had met by chance in Sydney, arrived in their hired car and even managed to park. 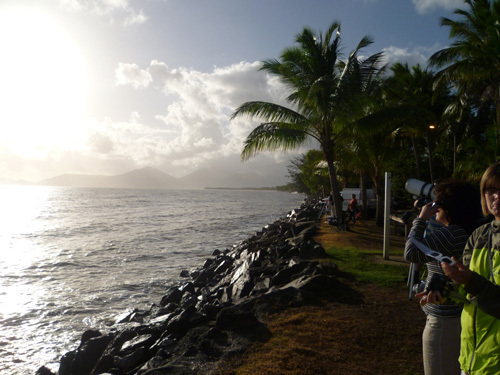 Another young man, Anthony (USA), had been so keen to join us, he'd actually walked the 12km from the city. 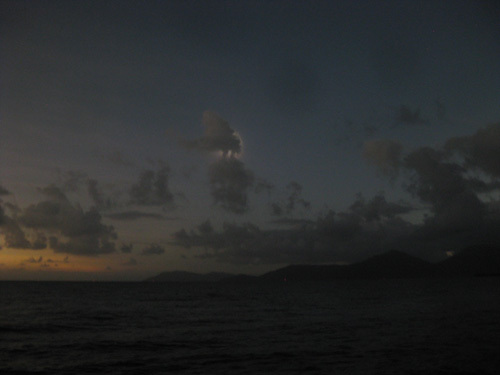 The line of lights along the horizon indicating the presence of boats at sea was augmented by a new light above them: Venus was rising. Dawn broke, with its reds and golds. Sunrise Reflected on the Sea. Much of the sky out to sea was clear with patchy cloud. 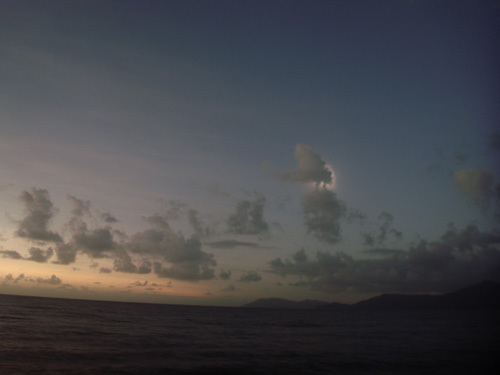 The sky over Cairns was overcast with one particularly large and slow moving cloud over a nearby hilly peninsula. 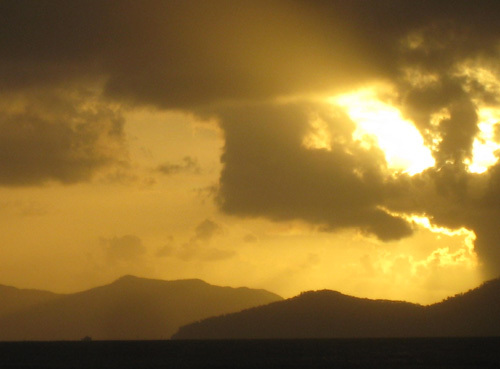 We were encouraged until the Sun rose and disappeared into this large and unmoving cloud. The partial phases begun but we could not see them. Weather being what it is, this large and unmoving cloud moved. It moved so much that the Sun appeared to howls of joy. Through our eclipse glasses we could see the boat shaped Sun, most of it now covered by the invisible Moon. But still, spots of rain fell, just to remind that it was still 50-50. Around 6:30 with less than ten minutes to go before totality, the sky began turning a deep blue colour and the sea gained a tinge of green. Birds began flying around, whole flocks of them. As the sunlight became point-like and intensely gold, dogs barked. The whole ambiance of the day was strange, unusual and unreal. Everyone was noticing and I heard gasps of wonder and even a little fear. A couple of minutes before totality, Venus was visible and I even saw Sirius, the brightest star. We were very optimistic as the dimming Sun glowed from a large part of clear sky. The Moon's shadow enveloped the clouds that were over the sea and turned them from white to grey in a matter of seconds. It turned the sky a deeply dark blue and the horizon red. The shadow moved from left to right and we followed it to the almost extinguished Sun. A rogue cloud, not big but big enough to cover the Sun began to cover it from below just as the Sun disappeared behind the Moon and the corona flashed into view. 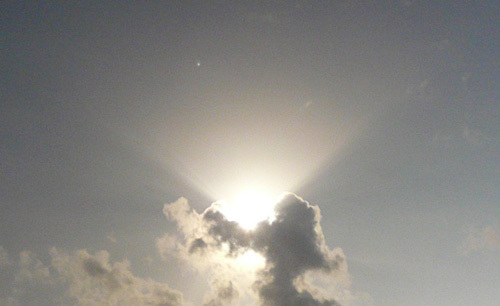 The presence of this cloud diverted the coronal light upwards into a cone of white light which included Venus. Totality begins with a cone with Venus. We could see only the top of the eclipsed Sun. It had become so dark that Venus and Sirius were easily visible. And then the coronal glow faded leaving the sky bereft. This tiny cloud in the wrong place at a very precious time removed the corona from view just as the Moon had removed the Sun. We were seeing most of the sky and it was dark. 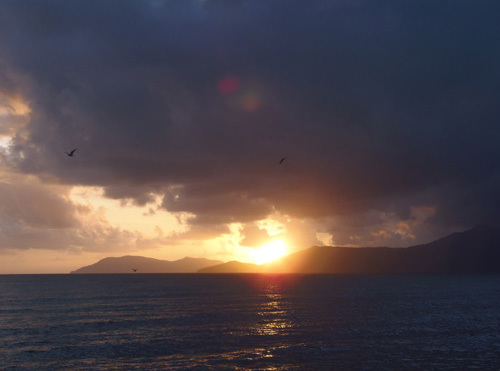 The red of sunset was visible over the sea. The clouds were grey, dark grey. Venus was visible. The cloud hid the spectacle for over a minute. Our optimism had turned to dismay. The cloud was still moving and it began to glow again. 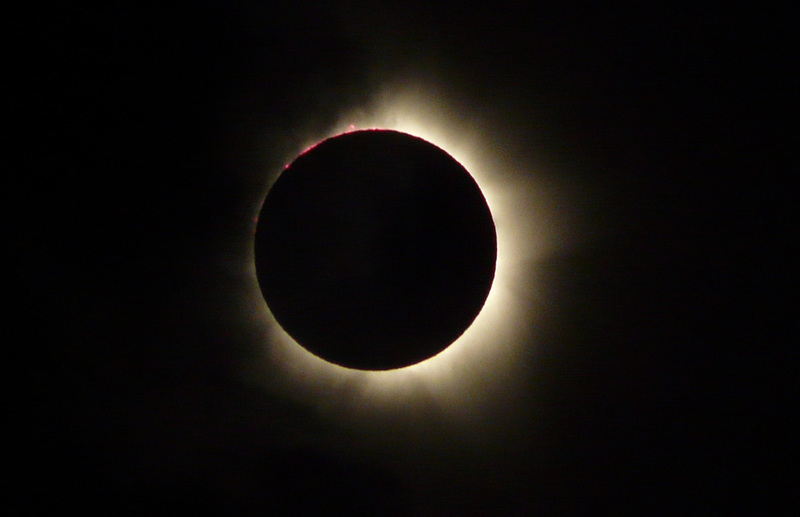 The glow, coronal in colour, that delicious pearly white only seen during totality, grew brighter. 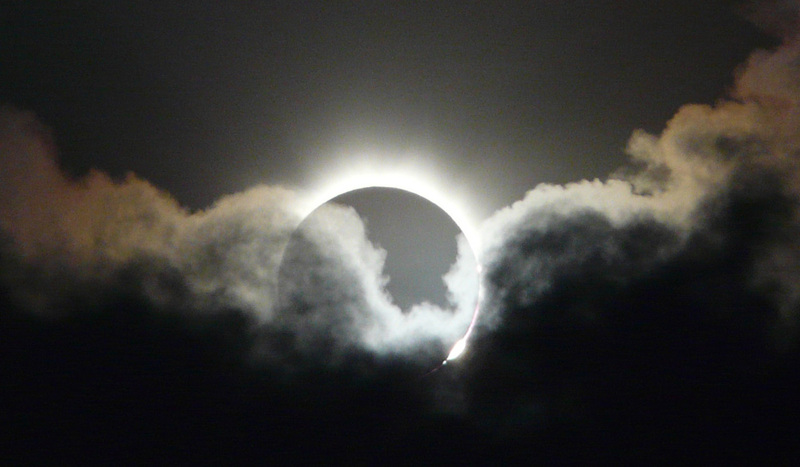 Would totality end first or would the cloud move away first. Then the corona appeared. A bit at first, Then more, then the entire gloriously eclipsed Sun. The spectacle was there for all to see. The locals who had not known what to expect were awed. The first timers, including friends and family that we'd persuaded to come. They were overwhelmed - a few tears were shed. The regular eclipse chasers who had been clouded out in China - we saw far more than we had dared to hope for. We could all see it. Then all of a sudden the sky to the left brightened and a beautiful and spectacular diamond ring appeared in the 11 o'clock position. It glowed brilliantly to everyone's pleasure. We had seen the beginning and end of totality, the most dramatic parts of the eclipse. We had missed the chance to savour the corona. Optimism which had been raised and dimmed and had turned from hope to dismay ended in pure joy at this wonderful event that nature had provided for us. What we saw may have been brief but it will remain in the memory for a long time. It had also been successfully captured to be shared with friends and savoured at leisure. The Approach of the Moon's Shadow at Machans Beach. 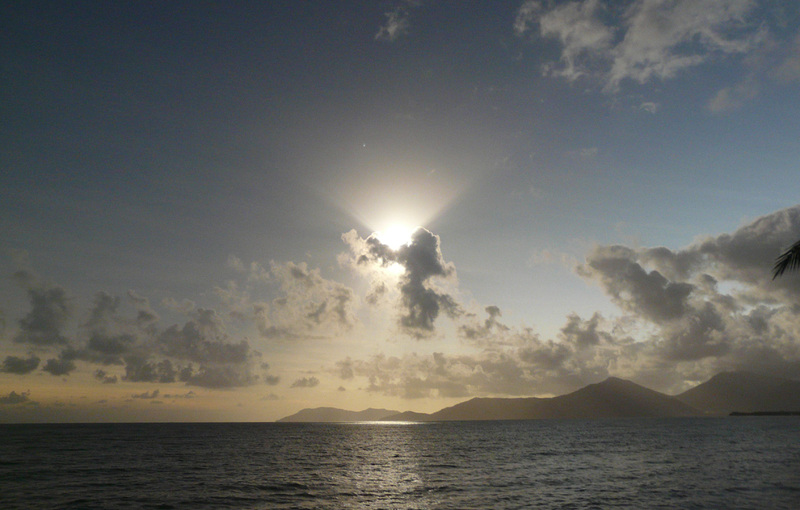 The Diamond Ring at Machans Beach. Written account and all text descriptions. (© 2012). All programming, video and photo editing. Totality begins with a cone with Venus. Bailey's Beads. The Corona and Prominances. The Chromosphere. The Diamond Ring. Dawn with Venus. Looking North During Totality. Looking North After Totality. Looking South During Totality. Looking South After Totality. Golden Shaft of Sunrise. Hidden Totality Start. The 2012 eclipse main page. Maps of the path of the 2012 eclipse from Fred Espenak and eclipse details at the observation site. 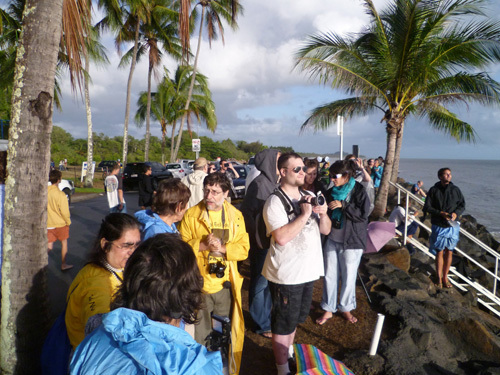 People from the 2012 eclipse. 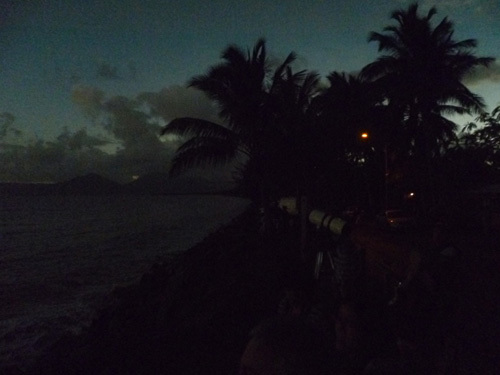 Stars and planets visible during the 2012 eclipse. 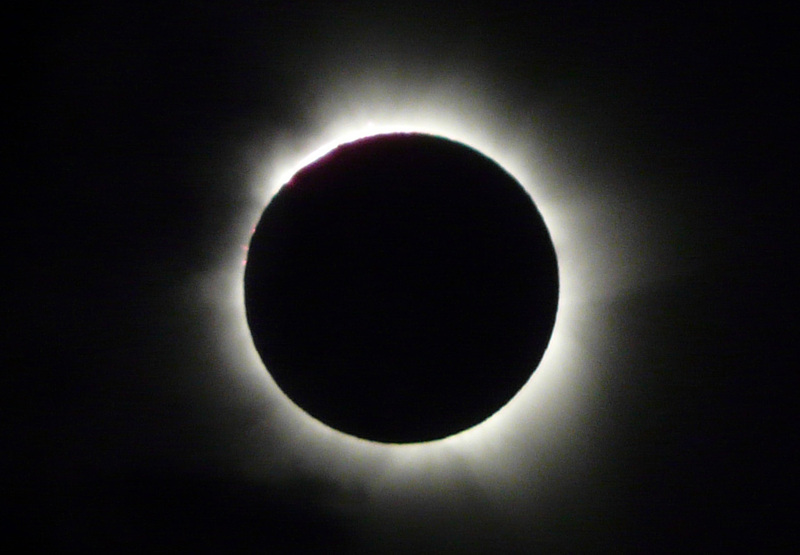 Photos of the eclipse site, the partial phases, totality, the diamond ring and the media. There are always photos that didn't quite work out. From Astronomy Picture of the Day.